The Ah Haa School is a turn-of-the-century train depot located in beautiful Telluride, CO. Set along the San Miguel River and surrounded by towering pine trees, the Ah Haa School provides the ultimate setting with its peaceful backdrop for your special day. This natural setting is perfect for creating memories that will last a lifetime. Apple Orchard is just 15 minutes from Durango, CO and is conveniently located near everything the Four Corners Region has to offer year around. The Apple Orchard Inn is a unique Durango, CO, Bed and Breakfast set in the beautiful Animas Valley. Lined with fruit orchards and historic farms, County Road 203 leads you to the Apple Orchard Inn. We at the Beaumont are happy to host your wedding ceremony at our historic hotel. The Beaumont is a unique and beautiful location for your memorable day. Two options are available to the bride and groom: Our Grand Staircase, or the outdoor courtyard of Bulow's Bistro. The Beaumont Hotel offers the elegance and charm of its history with the technology and services required for today's events. This wedding location is an ideal year-round facility with gorgeous mountain views, abundant privacy, and a world class kitchen. Whether you're planning for a wedding, honeymoon, family reunion, company gathering, or your own personal vacation retreat, Blue Lake Ranch Bed and Breakfast in Durango, Colorado invites you to experience a memorable and relaxing getaway in a magnificent private setting. Celebrate your Special Day surrounded by the majesty of Engineer Mountain, Potato Hill and lovely meadows. Whether you dream of a Colorado casual or exceptionally elegant event, Cascade Village Benchmark Event Center and pond area provide a spectacular setting for your ceremony, reception, dining and dancing! This also provides a back-up plan for any weather change that may pop up! The Cascade Village Benchmark Event Center can easily be set up to handle a small intimate wedding or a large formal wedding for up to 250 guests. The Chris Park Group Campground is eighteen miles north of downtown Durango. Three large sites, each accommodating 75 people, are available by reservation only. The Animas and Silverton wagon road passed through Chris Park in 1876. For the more adventurous couples, this rustic sight is a wonderful wedding location with a beautiful open pole barn, gorgeous meadows, and spectacular views of the 14k peaks surrounding the area. Dalton Ranch, set in the magnificent Animas Valley, just six miles north of Durango, CO. Dalton Ranch is the perfect venue for your Wedding. Our outdoor Event Pavilion is a host to many weddings throughout the summer season. The Redcliff Room offers spectacular Animas Valley and Golf Course views and is an ideal setting for your corporate meeting. The Doubletree is committed to making your dreams come true - with seemingly limitless venue options that range from down the street to the other side of the world, and an impeccable staff that sees to you and your guests' every need. Careful attention to detail comes through in even the smallest accessories of our hotels' stylish designs. After all, it's your wedding. This perfectly restored ghost town thrives on contradictions; hand-hewn log cabins exquisitely furnished, a life-worn saloon serving food of startling quality, lung torturing trails followed by pampering massages, sensuous hot springs beneath shimmering snow banks. Free of cell phones, this romantic old mining town is the perfect setting for your rustic and elegant wedding experience. We are pleased that you are interested in exchanging vows at Durango Mountain Resort. The breathtaking mountain views, customized packages and our friendly, professional staff all combine to offer you the perfect wedding. Durango Mountain Resort can accommodate your needs. We offer several excellent locations for weddings and receptions against the magnificent backdrop of the San Juan Mountains. Book your group of 20 or more passengers! The D&SNGRR has an experienced and knowledgeable staff dedicated to ensuring a great experience when booking your group reservation of 20 or more people on the train. We welcome wedding groups! Trips can be arranged to ride the train one way or round trip, or to ride a train/bus round-trip combination. 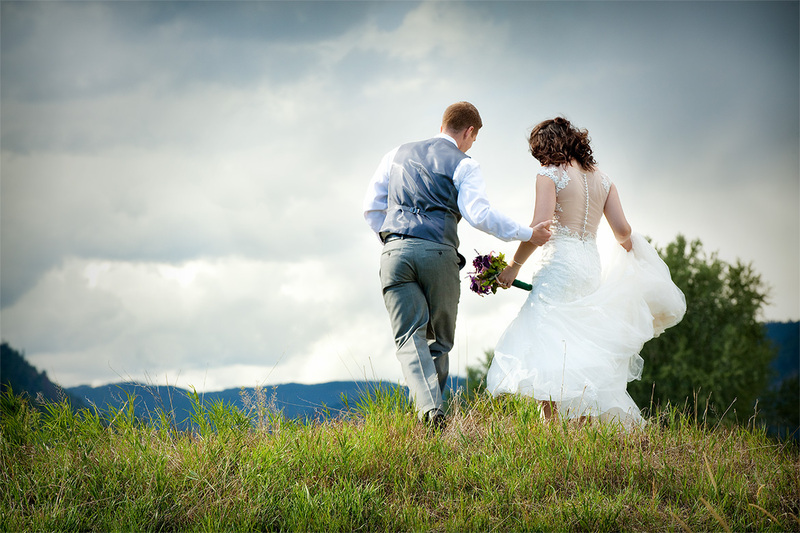 Echo Basin Ranch is the perfect location for your wedding. At 7,800 feet elevation, the ranch is covered with ponds, streams, mountain views and forests of aspen and ponderosa pines. The weather is delightful! We provide an ideal setting for your special day. Eureka Lodge can accommodate weddings of 150 guests or less. Overnight accommodations are available on site for 35 guests. Package pricing includes 2 nights accommodation for 35 guests and use of the lodge and grounds for the wedding ceremony. Weddings and special events are a source of joy and happiness. We honor those traditions by making your wedding our priority. Enjoy your wedding day knowing that we are there behind the scenes making your day run smoothly. We offer over 30 years of experience for you to take advantage of and wedding packages at several different price points that include the venue, rentals, and catering. The General Palmer Hotel is a prestigious Victorian style hotel with a Four Diamond Rating from the American Automobile Association for 32 consecutive years! Located in the heart of historic district of, Durango Colorado, and surrounded by the beauty of the San Juan Mountains, the General Palmer Hotel offers Victorian elegance and unparalleled service. On the western slope of the Continental Divide, among exposed cliffs, streams, meadows, wildlife, surrounded by three million acres of national forest is a 27- hole golf course. This is Glacier Club, a completely private golf and residential community just outside Durango, CO. Designed by award-winning architect Jon Pomeroy. The stunning cliffside views make indoor and outdoor weddings a feast for the eyes. Named for the family that built the ranch, Gorrono was once a Basque sheep herder's farm in the 1800s. Recently renovated, today Gorrono Ranch is a favorite venue for weddings and events because of its authentic beauty, breathtaking views, and unsurpassed service. A truly magical place, Gorrono Ranch offers an extraordinary and private Colorado mountain experience. Kendall Mountain Community Center has the feel of a secluded alpine lodge. The "Sultan Room," ideal for a large reception, has lofty ceilings, a wall of windows showcasing Grand Turk and Sultan mountains, and a hardwood floor that begs to be danced upon. Astonishing views in all directions, generously proportioned wrap-around decks, a stonework fireplace, full kitchen, and a very private setting. Nestled in the heart of Colorado's San Juan Mountains, Keyah Grande is an exclusive, private villa bearing more resemblance to a French chateau or Italian palazzo than to a customary Western farmstead. At 7,000 this guest ranch commands a view over the 4,000-acre estate and the unspoiled forests just outside of Pagosa Springs, Colorado. This 100-acre private ranch is nestled in the heart of Bayfield, Colorado, just a stone's throw from Durango. The Pine River, an eight-acre lake, countless streams and green meadows paint the perfect setting for your event. Any time of year is perfect for a wedding in Ouray. The summer climate is pleasant, with low humidity and warm temperatures. Cool crisp air and warm days are typical of the fall season and the winters are spectacular with clear blue skies and glistening powder snow. Ouray offers a change of pace, stunning scenery, fresh air, and the opportunity for fabulous wedding photos. Hold your next business meeting or special event at The Peaks Resort, where events come to life and agendas are unleashed. Our peaceful mountain setting allows participants to focus their minds and unlock their creativity. We're committed to making your stay as unique and comfortable as possible. Treat yourself to everything from endless recreation to rejuvenating treatments at our Spa. Just five minutes outside of downtown Durango, Sleeping Beauty Ranch is set against a beautiful band of red rock cliffs, a perfect backdrop for your perfect day. Whether guests enter by car or train, Sleeping Beauty Ranch offers all the necessities for our wonderful, but unpredictable Colorado weather. The Schmid Ranch, located just 10 miles west of Telluride, Colorado offers peace and solitude with a backdrop of the towering Wilson Peak. The ranch offers the perfect environment for anything from formal catered dinners to casual barbecues. The Schmid family is committed to making your wedding a truly memorable event. Just an hour outside of Telluride in the heart of the San Juan Mountains, Secret Garden Bed & Breakfast offers everything you need for the perfect mountain wedding venue. See how easy it is to get to Ouray for your dream mountain wedding. The Silver Mountain Ranch offers an unforgettable setting with an unparalleled view of Silver Mountain in the background, overlooking the lake and our romantic gazebo. We offer a covered pavilion/event center for your. Weddings. Couples who want to get away and enjoy the wild beauty of the mountains will enjoy the intimate cabin, Lonesome Dove. Located in the heart of downtown Durango, the location of the Strater Hotel allows guests the opportunity to explore all of the wonderful venues that Durango has to offer. The wedding event professionals will help you plan your entire event from beginning to end, all details included. This beautiful facility combines the ambiance of Victorian charm with an uncompromising attention to modern convenience and detail. The Retreat at Thunder Ridge is a spectacular 14,000 square foot log lodge, nestled high in the beautiful Rocky Mountains of Colorado. Located 14-miles northwest of Durango, it is easy to get to, and well worth the trip when you arrive! The lodge was built to accommodate a variety of Evangelical Christian retreats and wedding occasions. The Wagon Road Ranch is a 1940's log ranch house with a new Arts & Crafts style sleeping wing on a beautiful 35 acre property 4 miles from downtown Durango, Colorado. In the beautiful log house there is 4,500 square feet of living space with 4 bedrooms each with a private bath. The Ranch will comfortably sleep 13 people. There are three wonderful fireplaces and two stocked fishing ponds to make the setting complete. An intimate site with extensive gardens, a private lake, boats, fishing, mountain views, forest and streams, Abode at Willowtail Springs B&B Cabins is located 30 minutes from Durango. It is the perfect location for small weddings, romantic elopements or honeymoons and an exquisite site for interior and exterior photography shots.